Q - Do we provide the skip hire service? 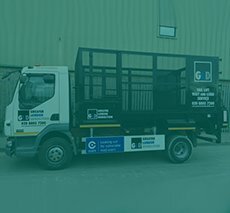 Yes we have a large fleet of vehicles that will deliver the skip whether it is our Mini Skip, Builders Skip or Large Skip to your door quickly and efficiently. Q - Do I need permission from the local authority when hiring a skip? Yes, in most cases we can organise the skip license on your behalf. Licence charges vary between Councils and Local Authorities but all costs will be explained by our knowledgeable sales team when ordering. Q - What if I cannot get a skip licence? 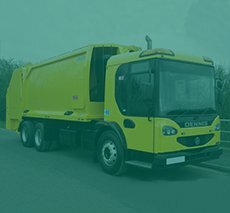 If your council refuses a licence - which is rare - we are able to offer alternative solutions to dispose of your waste including a Wait and Load service. Please ask our sales team for more information. Q - What size skip do I need? We offer a wide variety of skip sizes available to suit all requirements. However think sensibly about the size of the project or waste that you have to dispose of. One large skip will be more cost effective than eventually having to hire two smaller ones. You tend to always find additional waste; failing that your neighbors generally do! Q - How do I order a skip? Please call our sales team today on 0208 805 7200 to organise the delivery, collection or the exchange of a skip. Q - How long can I keep the skip once it is delivered? 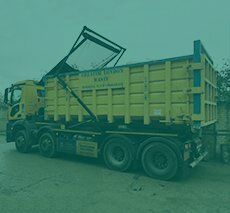 You are paying for the skip not a period of time, so the price is the same for one day as it is for one week. Skips are usually kept for two weekends however individual requirements can usually be accommodated depending on availability. Q - How do I pay for the skip? Paying for you skip is easy you can either pay the driver on delivery by cheque and a receipt will be given to you at the time of payment. Or you can pay by credit or debit card over the phone to our sales team when you order the skip. We accept all major credit/debit cards so you don’t even have to be on site when the skip is delivered. 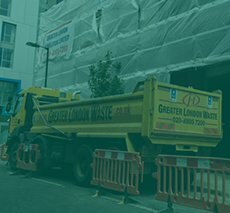 Likewise if you are a business that will require multiple skips you can set up a business credit account with Greater London Waste Disposal. Q - How much notice do you need? We pride ourselves on delivering a first class efficient service to you. In most cases 24 hours notice is required. This is dependant on the licence being issued by the local authority. For those customers who have tight time constraints, we will do our utmost to work around your requirements. We can also work out of hours on special request. Q - What is classed as hazardous waste? Hazardous waste that can not be put into any of our containers without prior notification includes asbestos, tyres, fridges, freezers, batteries, television and computer screens, gas cylinders and fluorescent tubes. Containers with any of these items in them will need to be handled carefully by our trained staff. Q - What happens to my waste after its collection? After collection all skips are taken to our purpose built waste transfer station for recycling. 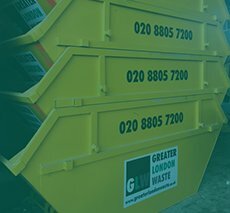 At Greater London Waste Disposal we aim to minimise the amount of waste going to landfill so anything that can be recovered will be processed for recycling. We are serious about the environment so continuously update and review a greener environmentally friendly policy.